Case Study 1: Contoso, Ltd.
Case Study 3: Litware, Inc.
You are developing a Universal Windows Platform (UWP) app that will be published to the Microsoft Store. The app will contain the following method. A. Create a Windows Runtime Component project. B. Add a class file to the project. C. Create a portable class project. 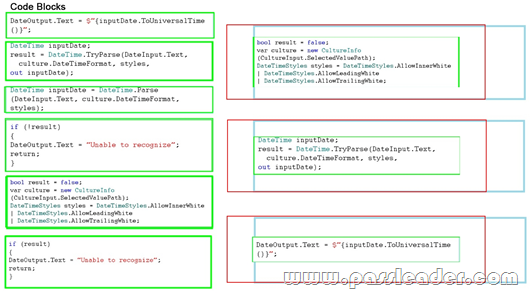 D. Add the method to the App.xaml.cs file. You are developing a cross-platform app by using Microsoft Visual Studio 2015. The app will be available to Windows, Android, and iOS devices. You need to gather usage telemetry for the app across all three platforms. What should you use? You are developing a Universal Windows Platform (UWP) app. You need to implement remote debugging of the app on a tablet device. What should you run on the tablet? 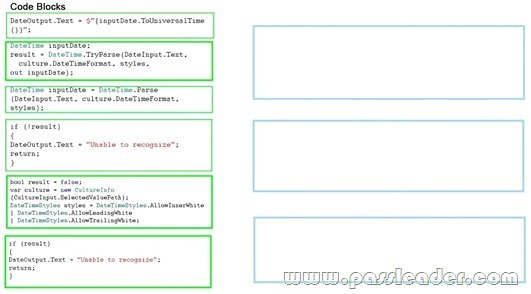 You are developing a Universal Windows Platform (UWP) app that will have ink capabilities. You have the following code that configures the InkCanvas control. You need to develop the code for Button_Click. You write the following code. Which code should you insert at line 03? Develop the solution by selecting and arranging the required code blocks in the correct order. NOTE: You will not need all of the code blocks. You are developing a Universal Windows Platform (UWP) app that will retrieve data from a Microsoft Azure SQL Database. The app will be used by multiple users simultaneously. You need to ensure that the app can use optimistic concurrency. What should you do? A. When data is accessed, set the transaction isolation level to Serializable. B. Add a column of the integer type named Lock that will be set to 1 when a user reads the row. C. When data is accessed, set the transaction isolation level to ReadUncommitted. 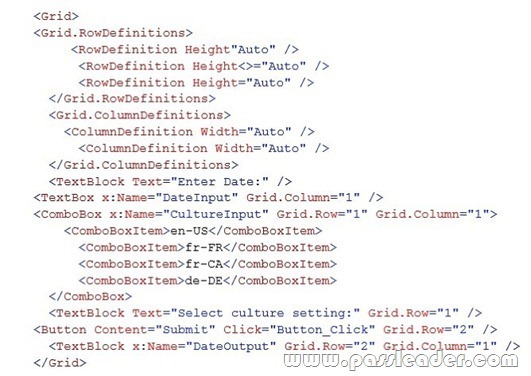 D. Add a column named Version that contains a version number that will be incremented when a row is updated. You are building a Universal Windows Platform (UWP) app that will be used to view images. When a user clicks an image by using a mouse, the image will increase in size by 20 percent, and then return to its original size when the user releases the mouse. You create event handlers to handle the PointerPressed and PointerReleased events for the image. The user reports that occasionally, the image fails to return to its original size. You need to ensure that the image returns to its original size. Which three events should you handle? Each correct answer presents part of the solution. Download the newest PassLeader 70-354 dumps from passleader.com now! 100% Pass Guarantee!